2017 Senior Citizens Sport Award – FIVE WINNERS !!! Frank Grainger has been on the YMCA Challenge Committee for over 10 years and has made it his mission to encourage people from across the community to take up and enjoy cycling. He regularly leads rides throughout the season and his encouragement and mentoring has ensured that our beginners really do enjoy their time with us becoming expert cyclists as a result Frank does all of this voluntarily and his commitment to our Paris 3 Day cycle event embodies what the YMCA is about. Each year everyone who takes on the event is grateful to him but he is not one to bask in glory and shies away from public recognition. Mike Ormorod has been a senior member of Redhill Cycling Club for many years. He continues to lead and organise group rides including away weekend trips to France. He has been a Committee member for some years and looks after the press and publicity. In addition he takes part in the YMCA challenge rides plotting the routes and leading groups recently completing the YMCA challenge ride from Geneva to Turin. The last thing I would add is that he is 78 years young! Mike Pocock represents Reigate Priory Athletic Club at the V60 category and has consistently won numerous races in his age category, beating runners 30 years his junior. His athleticism and fitness is a credit to the careful training he undertakes. His London marathon time of 3 hrs 20 minutes placed him 28th in his age category. He won the Reigate Priory summer 10k V60 category in 44.13 beating the next V60 by 1 minute 24 seconds. 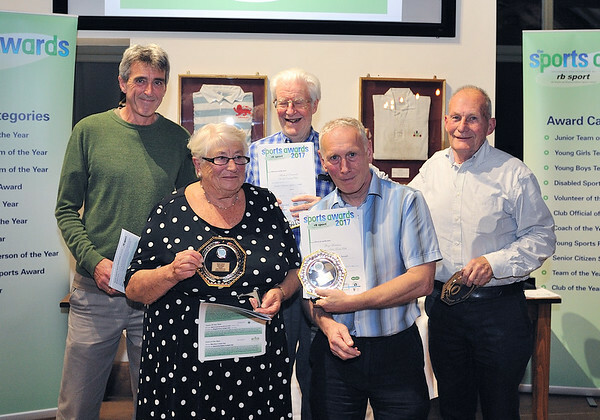 Joan Powell has been a member of Reigate Lawn Tennis Club since the 1960’s Joan has run Monday night tennis and coaching at the club since 1967. These evenings are designed to encourage new members into the club. They include beginners and people coming back to the game after a break. Her approach has always been inclusive and encouraging providing a welcome to all levels of player. After 50 years unbroken service in this role, she has now decided to stand down. It is an amazing record which will probably never be equalled and deserves recognition. Roy Hutchins runs the Roystons Table Tennis Club which is open on every Monday night. It is attended by up to 50 players having originally started in 2001 with 6 people. He has been running the club for the best part of 3 years with only one part-time assistant. He supervises the activities and provides coaching to junior players. He ensures that all the equipment is maintained and repaired. He has enabled this very valuable facility to continue by giving his time every week and we feel that his dedication to table tennis in Reigate and Redhill should be recognised.